With Ghost closing in the West End in October I thought I should finally go and see the two current leads on stage together. 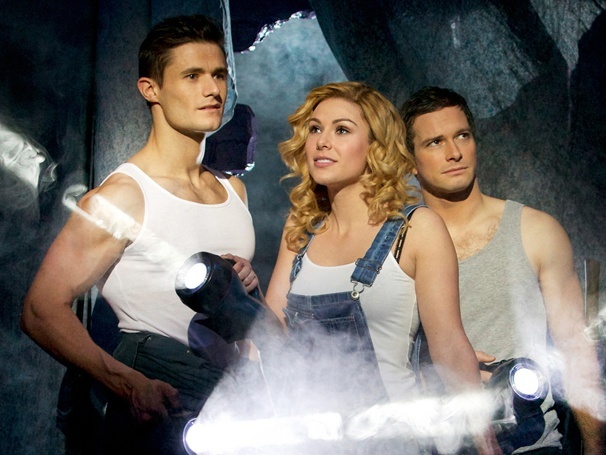 The first time I watched the show after Caissie Levy and Richard Fleeshman had left Sam Edwards was on as Sam and I very much enjoyed his performance but didn’t think him and Siobhan Dillon had the best on stage chemistry. I put that down to him being the understudy and not getting the chance to perform with Siobhan a lot and it didn’t bother me that much. So this time I managed to see a full cast (not sure about swings in the ensemble I admit as I’m not that familiar with the cast – I do know Louise Lawson and Darren Carnall were not on though). First of all I’d like to say that I think Ghost is a great new musical. Yes, the score isn’t perfect and yes, the show doesn’t really add anything to the story of the film. However, personally I like the way this popular movie has been adapted for the stage. I think the choreography is interesting and I enjoy the big ballads in the show such as “With you”. Plus the effects are without a doubt rather stunning to look at even though I have figured them all out by now. I adored the original leads Caissie Levy and Richard Fleeshman. They were stunning together (and still are in the Broadway production) plus Caissie has a voice to die for. So I certainly was slightly biased but I did my best to give the new leads a fair chance to “WOW” me. Sadly that didn’t happen. Siobhan Dillon has a lovely voice even though her singing doesn’t amaze me the way Caissie’s does. However, her Molly is simply too tough for my liking. I’m not touched by her performance because for me she is radiating a “I’m a strong woman” aura rather than being a completely heartbroken “girl” who has lost the love of her life and doesn’t know how to move on. To be fair I do think she has improved a lot since the first time I saw her. Her acting in the final scene is lovely and yes, I did tear up when Molly said goodbye to Sam. Mark Evans is certainly nice to look at and he has a wonderful and clear voice. But sadly I’m left cold by his portrayal of Sam. I find his acting rather wooden and his facial expressions are slightly over the top from time to time. He does ok in the funny scenes and his timing is good but he doesn’t manage to take me along on Sam’s emotional journey. But what bugs me the most is that I can’t believe in Mark and Siobhan as (on stage) lovers. They are lacking chemistry and just seem to act next to instead of with each other. Since Sam and Molly’s strong bond is one of the key themes of Ghost this lack of chemistry has a big impact. While perfect on the technical side the show is missing heart and soul. 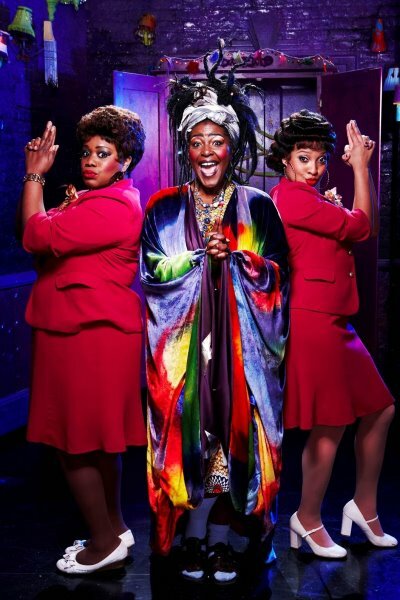 Sharon D Clarke steals the show as Oda Mae Brown. Her portrayal is spot on and you can’t go wrong with such a voice. “I’m outta here” is a real show stopper and remains one of the highlights of the show for me. Andrew Langtree has developed so much since the first time I saw him as Carl in 2011. I remember thinking that the whole character was simply too “panto” and one-dimensional. Carl is still a cliché bad guy but Andrew manages to deliver a performance that is a joy to watch. He doesn’t ridicule his character but he also doesn’t take Carl seriously beyond measure which is the perfect mix. The ensemble does a great job even though I think they are not as slick as the original cast. But then those guys and girls went through the very first rehearsal progress for a brand new show together. That has to result in a strong bond that is visible on stage. And in the end this is just a tiny criticism. Special mention for Lisa Davina Philip who I found hilarious as Clara (and what a voice!!). As always nice to see Paul Ayres on stage, I certainly do have a soft spot for former Jersey Boys. I still don’t see the point of “Ball of wax”. It’s painfully out-of-place and destroys the atmosphere right after Sam’s death. On the other hand I love the act one finale. “Suspend my disbelief” / “I had a life” is such a strong musical number and always leaves me with goosebumps on my arms. Ghost remains a good show and if you haven’t seen it yet I recommend you go while it’s still around in the West End. For me the “problem” with the show lies with the new leads who simply don’t reach the pure awesomeness of Caissie Levy and Richard Fleeshman (just my opinion, of course). So at this point I think I’ll rather keep my memories of the “perfect Molly/Sam duo” and let this recent visit be my last. However, I might change my mind in case I get a chance to see Sam Edwards again. I share your sentiments on this. Siobhan has talent but with her physique she is in danger of becoming typecast as strong. At times that is not a weakness – for example at West End Bares last year where she was sans top! However the tenderness required here was not present. How “daring” do you think West End Bares will be this year? I wasn’t overly keen on the pasties last year – bit too stripperish. I loved Siobhan in Legally Blonde. The tough Vivienne suited her much better than Molly. I could see her as Alex in Flashdance as well. She’s perfect “strong woman” material. I really enjoyed Bares last year. Thought most numbers were well choreographed and loved how much effort everyone had put into the whole event. I imagine it will be another great night out this year. I’m just waiting to find out more names of performers taking part.